Stylish, timeless and yet on trend, double-gauze bows are the perfect, lightweight accessory! • ONE hand-tied pinwheel bow attached to a right-sided alligator clip with teeth – made to fit comfortably yet securely. • ONE hand-tied pinwheel bow headband. Our nylon headbands are the best quality you can find! Soft, stretchy and will grow with your child over time WITHOUT losing its shape. Our headbands make great newborn bows because they're comfortable and gentle (perfect for take-home outfits and newborn photo props)! Styling: They're oversized on younger babies and become an everyday bow as they grow. Each one measures ~ 5" x 3”. • All thread is secured and can't be untied by little hands. • Our accessories are handmade with love and guaranteed. Any issues down the line? Just message us and we can work something out! ★ Looking for a smaller bow for your babe? We make mini pinwheels too! 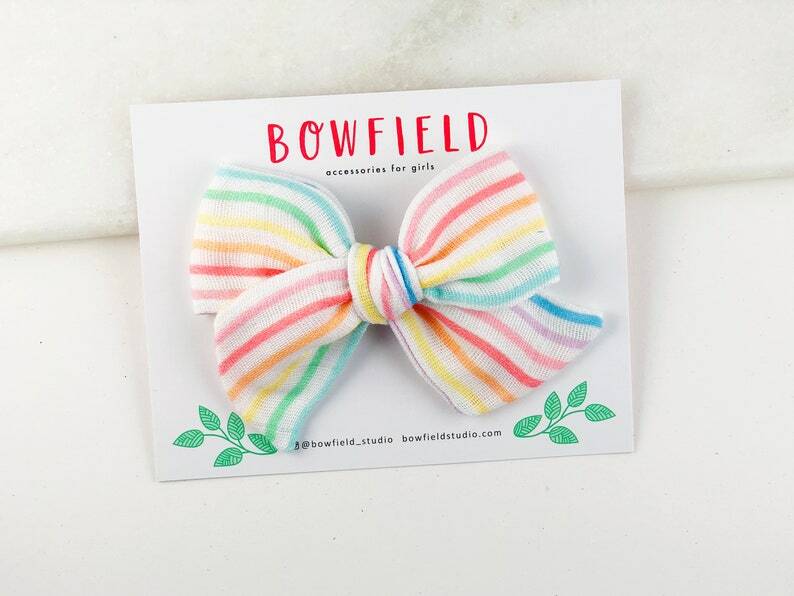 ★ INSTAGRAM @bowfield_studio for discounts and a whole lot of cuteness! Do not leave children unsupervised while wearing accessories! We hand make each one with great care, but they do contain small parts which could pose a choking hazard to young children. These bows are gorgeous! Love the unique fabric options and great quality. Will be ordering again soon! this print is so beautiful in person! Such a soft delicate colour ! Your satisfaction is very important to us. If there is any problem please contact us so that we can work out an arrangement as quickly as possible. We'll do our best to make it right for you. Where are Bowfield hair accessories made? Bowfield accessories are made in a pet/smoke free home studio. Please understand these are guidelines, they are not guaranteed delivery dates. We are not responsible for parcels being delivered beyond the guideline delivery date. These guidelines are not be be confused with our processing time. Our processing time is currently 1-3 business days. In order to keep shipping costs low, all shipping is done via Canada Post Regular Mail which doesn't provide a tracking number or insurance. If you require tracking or insurance, please upgrade your shipping at checkout.